But this year, I decided to splurge. We have a new “smart” TV that has SLING on it, so we are splurging for 2 months to be able to watch the Hallmark channel on it so I can join in the Christmas movie fun. Anyway, I may or may not have become a little addicted. I know, I know. There is a WHOLE lot of the predictability and the same plot over and over (Lots of career-addicted-women are introduced to the charms of a small-town-Christmas by a dashing hometown handyman of some sort.) I’m not putting them down–I watch them and sigh at the end and ignore my husband as he pokes fun. There is just something fun and sigh-worthy about Christmas-themed happily-ever-afters. 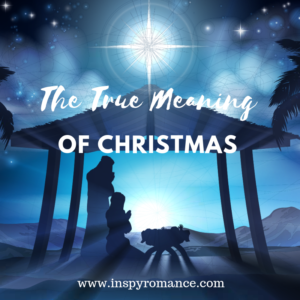 One other common theme, though, is “The ‘true’ meaning of Christmas.” Most all of the main characters are either avoiding it or searching for it or getting itall wrong or are teaching their soon-to-be significant other about it. But what IS the true meaning of Christmas? Family? Love? Giving? Cheer? Joy? Peace? All GREAT things. Really, they are. Personally, I’ve always believed that JESUS was the true meaning of Christmas. Celebrating our Savior’s birth–by spending time with family He’s blessed us with, by sharing love, by giving, by spreading cheer, by realizing the JOY that Christ brings, and by experiencing Peace on Earth that Jesus came to bring. Yet–This year, I’m contemplating it on a slightly deeper level. I know– sin doesn’t seem very fa-la-la-la-la. But I’ve been reading through parts of the Old Testament lately and am currently in 2 Kings. And my heart is sick at what I’m reading. Completely disregard of God–turning their back on a God who saves and embracing gods that are completely worthless and man-made. They don’t deserve a Savior. None of them do. I just want to yell at them as the story unfolds and as they lose the promised land God had given them because of the evil in their hearts. Then I remember–I was just like them. I was born a sinner and didn’t deserve God’s love either. I’ve been selfish, I’ve made man-made things more important than God. I’ve followed my own desires instead of serving God. Maybe I didn’t practice human sacrifice to other gods (my kids say PHEW!) but I have the same need of a Savior. It was for OUR SIN that Jesus came. It was because of OUR SIN that Christmas is even a thing. Christmas is about Jesus–but this year I’m reveling in that even deeper. I’m realizing afresh the wonder of that–how undeserving I am of that. I’m realizing how DUMB it is to stress over parties and gift giving and decorating and what to get people and what to put on your Christmas list and all these other crazy things that make the season stressful. Christmas isn’t even about giving things–it’s about what we’ve already been given. JESUS! He has come to SAVE us. How AMAZING is that. Everything else is just fun ways to celebrate that, but not at all the point and not even a little bit worthy of being stressed over. I know this is a little off the romance topic. But–I firmly believe that our relationship with Jesus is the ultimate romance. He sacrificed so that we could have life. Can’t get much more swoon-worthy than that! I pray that you can stop and revel in the “true” meaning of Christmas this year. Blessings everyone, and Merry Christmas! A lovely post thank you. Love your post. I agree. Hi Krista! Wow! What a powerful and thought provoking blog! As a retired pastor’s couple, we often discuss of “sin,” its causes and affects on humans is avoided in our churches and in the lives of people. Thank you for sharing. Blessings and Happy Advent. Totally agree. We don’t like talking about our sin–but it’s an important topic… we needed a Savior for a reason and we want to gloss over that fact!! What a great post, Krista! I’m the same way when I read the O.T., and once while reading through Psalms, I got really irritated at David’s whining – but then I have to remember that the nation God intended to be the Bride, cheated on Him. Wow. Thanks for your thoughts today! Definitely!!! I always think that about the Israelites whining in the desert… but then go through a desert season of my own and the struggle not to whine is HUGE. Amen. It’s so easy to lose the really meaning of Christmas; I’m thankful for these moments when I’m reminded of what Christmas means. Thanks, Krista. I remember one time my husband was preaching through Romans, and one of his sermons really hit me with how awful my sin is, and how much I need Jesus. I’d sort of believed it before, but that time it really hit me. I’ve never really heard the meaning of Christmas described that way before, but it’s so true. Thanks for sharing. P.S. I love the Hallmark Christmas movies too, even though they are often cheesy. Thanks for sharing, Krista….I needed this! I’m with you, Krista. Jesus is the reason for the season. And I’m addicted to Hallmark movies. But my addiction is year round. I scan the guide a week in advance and set the DVR to record ALL of the new ones. I watch them when I have time. If I really like them, I keep them. If they’re just okay or I don’t like, I delete. The one thing I hate about Christmas is too much commercialism! Jesus is the reason for the season, right! Merry Christmas to you and your family! Jesus isn’t just the reason for the season. He is the reason for every day of our life!